The ZerolagHATEMA and ZerolagTEMA were presented by Sylvain Vervoort in “THE QUEST FOR RELIABLE CROSSOVERS” Technical Analysis of Stocks & Commodities, May 2008. 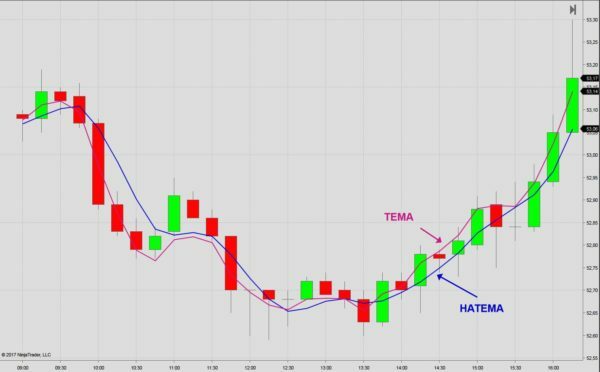 The Zerolag TEMA is a version of the triple smoothed moving average which is less smooth, but more responsive to market movements. For further details read article by Sylvain Vervoort. The Zerolag TEMA is a version of the triple smoothed moving average which is less smooth, but more responsive to market movements. The ZerolagHATEMA and ZerolagTEMA were presented by Sylvain Vervoort in “THE QUEST FOR RELIABLE CROSSOVERS” Technical Analysis of Stocks & Commodities, May 2008. A ZerolagHATEMA can be downloaded via their page, however, this indicator contains a serious bug. We have therefore created our own version of this concept. For further details, please read the article by Sylvain Vervoort.